#SchoolStories are the lifeblood of our 'story-led', creative websites. They are an effective, visual and engaging way for a school to really demonstrate what they do on a day-to-day basis: to "show, not tell" their community what makes the school so special. So, when one school shares great #SchoolStories that gets seen by millions of people we get pretty excited! With the #BeastFromTheEast causing some chaos across the UK, many schools were forced to close and see out the snow fall. 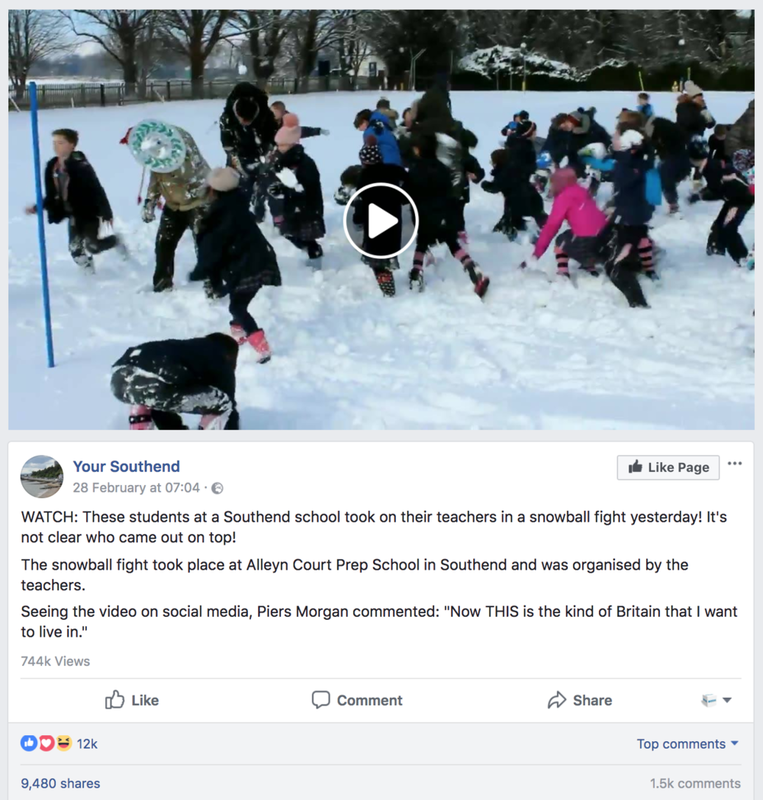 Alleyn Court, an co-ed preparatory school based in Southend-on-Sea, opted to stay open to celebrate the snow in the best way you possibly can...by holding a pupils vs. teachers snowball fight! This recording was shared on the school's social media, to be enjoyed by the school's community. What happened next however was incredible, as the story got picked up by major news outlets and turned into national news! Rupert Snow, head of Alleyn Court, was invited to talk on Good Morning Britain and Radio 5Live. What an incredible way to promote the school to millions of people in the UK (and outside). Alleyn Court's marketing is led by the strap-line of #CuriouserAndCuriouser. This is explored in the fantastic home page experience and website, and also consistent through their social media channels. A key marketing focus for the school is to develop greater awareness of the school's presence in Southend-on-Sea and surrounding Essex locations, as well as a school for people looking to relocate from London / commute to London. The school's core values are largely driven by providing amazing experiences for their pupils, to provide outstanding learning through an environment that promotes curiosity, creativity, wonder and a love of learning. 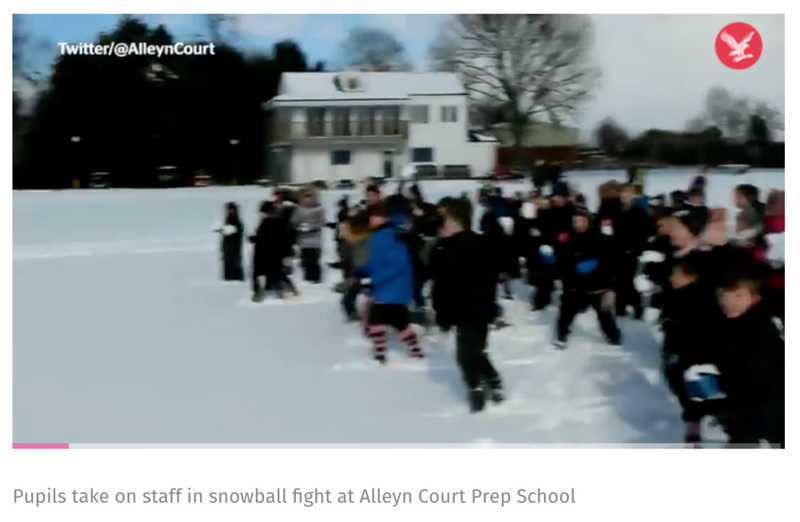 The snowball fight story is evidence of this, a real and authentic story that highlights the uniqueness of Alleyn Court. Why did the story go viral? The school shared a topical story, at the right time, with the right hashtag, and was seen by the right person. The beauty of social media is you’re throwing a net out there, and you never know who picks it up, or where it may go. 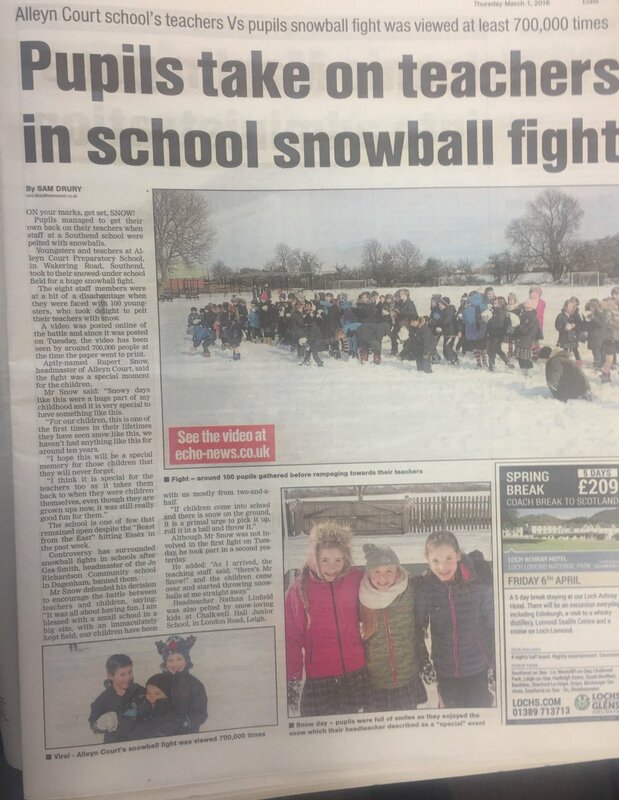 On the day, there were discussions on whether snowball fights should be banned in schools, making the subject perhaps slightly controversial. But from any controversy, Alleyn Court attracted the right type of parents and families who are aligned with the school's ethos. The school day is filled with loads of moments that a worth sharing, it is often the process of how to share #SchoolStories that schools fall short on. Schools should encourage and empower teachers and staff to share moments, particularly through the medium of social media. 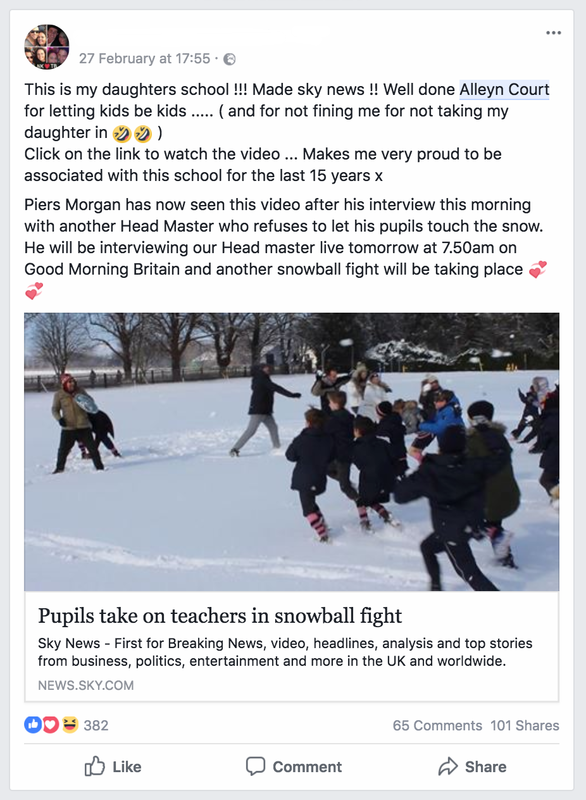 Viral stories, such as the snowball fight at Alleyn Court, are truly authentic moments that happen all over the world in lots of different schools regularly. The difference between this one and others is: were they captured? 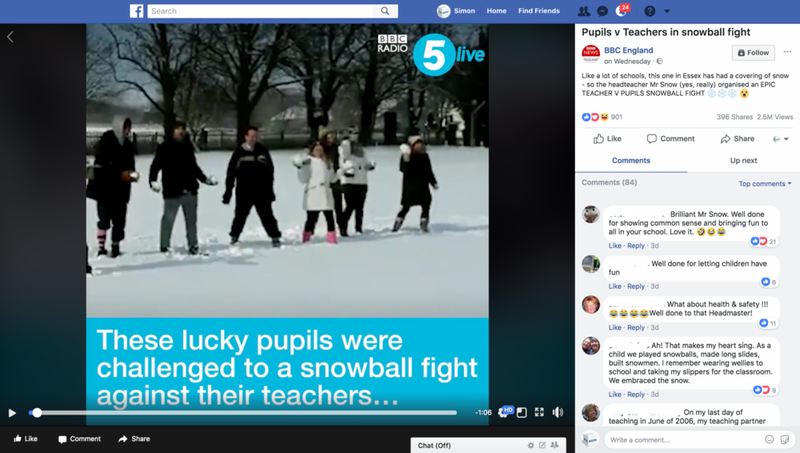 How many other schools in the UK had a snowball fight between staff and pupils? Probably a few, but the difference was this one was documented and shared. 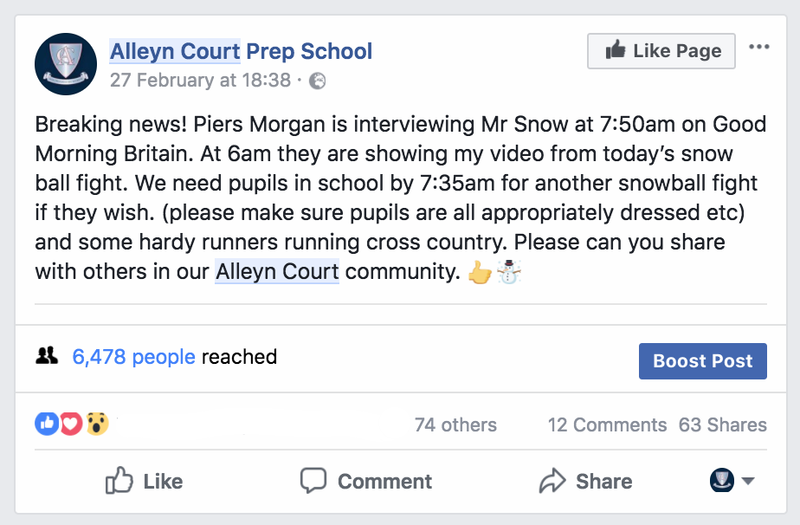 This story will forever be a legacy at Alleyn Court, a proud memory and perhaps a new tradition for every snow day? By sharing their video, the school was able to market to an incredible audience and become a part of something truly memorable. The future of school marketing residing within social media and want to see more schools sharing their unique, amazing #SchoolStories with the world. We offer training days for schools - where we will come and talk to the whole school, to inspire their part in marketing and sharing all those great #SchoolStories. We will help define your content strategy and support you in its employment across the entire school. It's time to ✨stand out✨ from your competitors - and perhaps you could have the next story to be seen by 12 million people?! !